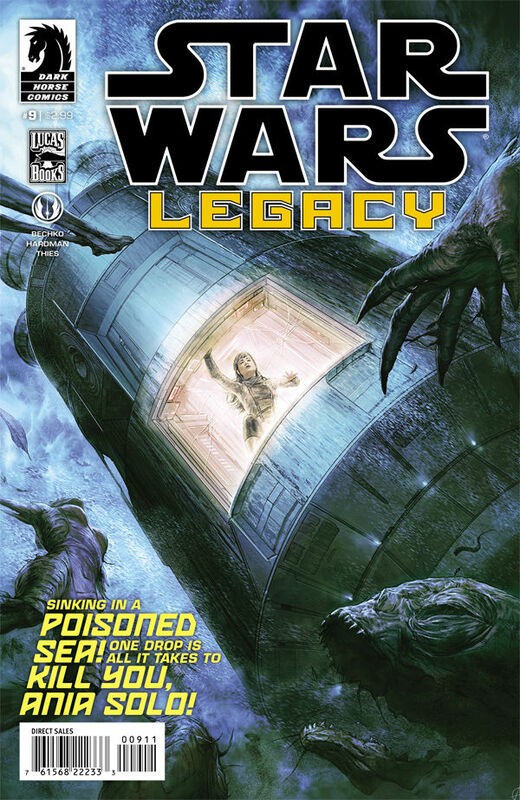 As I mentioned in my review of SW: Legacy #8, the story of the poisoned waters of Dac always hits a nerve for me. In Star Wars: Legacy #9, the gorgeous art of the panels as the team sinks through the water is disquieting and poignant. Besides the art, the story is just great. It has all the daring and dashing of any sci-fi adventure movie. Do yourself a favor and get on board with Star Wars: Legacy! Check out our other Star Wars: Legacy reviews! Ania Solo is in over her head—literally! With their escape pod sunk in an ocean of poison, she and Imperial Knight Jao wait for rescue. But even if it comes, they still have to free the slaves in the orbiting docks—with an army of pirates standing in their way!